The pursuit of places on Earth rarely seen by human eyes has taken geophysicist Beata Csatho across the globe, from the frozen ice sheets of Greenland and Antarctica to the windswept mountains of South America and Central Asia. Geology faculty member Beata Csatho has participated in seven scientific expeditions to Greenland, Antarctica and Alaska. The impulse to explore dovetails with her academic interest in remote sensing, which employs satellites and other technology to learn more about distant places, such as the polar regions or remote mountains. In fact, Csatho, a Hungarian native who joined the UB faculty last semester as an assistant professor in the Department of Geology, College of Arts and Sciences, says she moved to the United States to explore "bigger frontiers" after spending a year in Flagstaff, Ariz., as a Fulbright Scholar with the U.S. Geological Survey in the early 1990s. The adventurous projects she has been a part of since she left a job related to mineral exploration at Hungary's Eotvos Lorand Geophysical Institute (ELGI) in Budapest are perfect for a former recreational mountain climber, notes Csatho, who participated in seven expeditions to Greenland, Antarctica and Alaska between 1994 and 2006 as a full-time researcher with the Byrd Polar Research Center (BPRC) at Ohio State University. Polar research in the Southern Hemisphere is based out of McMurdo Station, which, she says, resembles a "mining town" on an island located more than 2,000 miles off the southern shore of New Zealand. Thousands of international researchers flock to the site in the southern spring and summer, notes Csatho, who has traveled to Antarctica from McMurdo Station with teams ranging from several people to large groups that included support staff. "A big part of working there is really preparing," she explains. "One has to go through medical exams and courses and preparing and shipping." Researchers are transported from the station to the frozen continent via special four-engine turboprop planes called Hercules LC130s, which feature ski-equipped landing gear to touch down on snow- and ice-covered terrain. A trip to a single destination in the field can last as little as two hourshop-scotching between several sites in one dayor as long as two weeks, she says. "In the beginning, even in the '90s, the major difficulty was communication," Csatho says, pointing out the absence of available Internet at the time and satellite phones that failed in the most remote locations. "If you had trouble with instruments or with equipment, you had to solve it as best you could. "I do lots of processing with computers," she adds, "and doing that in a tent when it's nine or something degrees can be hard. When you are in a small group you have to cook, you have to collect data and you have to do the processing." Much of the research Csatho conducted with BPRC involved efforts to better understand ongoing and historical changes in polar ice sheets. This included data collection from NASA's Ice, Cloud and Land Elevation Satellite (ICESat), which she and colleagues helped calibrate after its launch in January 2003. Her fieldwork also involved measuring ice velocity at more than a hundred locations on the Greenland ice sheet by placing small stakes in the ice and returning to remeasure their positions at a later date, Csatho says, noting that snowfall frequently turns finding the pale aluminum posts on the return trip into a challenge. "When you collect data, it's good to at least pre-process it on the field to be sure the quality of the data is good," she says. Rapid changes in the ice flows of the West Antarctic Ice Sheet and significant changes in the thinning rate of Greenland's Jakobshavn Glacier during the past century are among the discoveries revealed through research she has conducted. "Part of it is natural because there is a set of natural cycles in climate," says Csatho, "but part might be part of a trend. That is still a debate. It could be human-inducedso it could be part of global warmingbut exactly how much?" The question underscores the importance of further research, she says, explaining the precise extent to which these changes are natural versus man-made is difficult to determine since intense scientific observation of the poles only goes back about 20 years. 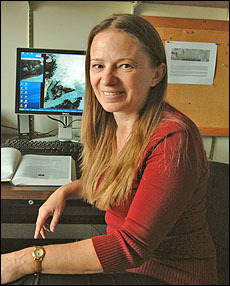 "The polar regions are changing so rapidly," she says, "it's good to have lots and lots of data." Csatho's research continues at UB as part of a large international project that aims to apply to land mass geodetic and remote-sensing techniques similar to those she has used in the past on ice sheets. Instead of measuring the changes of polar ice sheets directly, this project utilizes the fact that the enormous weight of the ice sheets causes the Earth's crust to sink. As ice sheets change due to climate variations, she explains, fluctuations in their weight cause the surrounding land to rise or sink. Although the variance is measured in terms of centimeters or millimeters, Csatho notes that these small changes can be precisely measured by continuous GPS receivers which, once installed, will continue to operate unattended for several years. She adds that the project will include additional research trips to Greenland. The recipient of master's and doctoral degrees in geophysics from the University of Miskolcwhich is in her hometownas well as a master's degree in applied mathematics from the Eotvos Lorand University in Budapest, Csatho says a faculty position seemed the right step forward from full-time researcher. She says UB fit the bill because it is an institution with a department interested in remote sensing that puts her in touch with colleagues whose work jibes with her own. At the moment, Csatho resides in an apartment near the North Campus while maintaining a second residence in the scenic Hocking Hills region south of Columbus, Ohio. "I'm still sort of commuting," she says, noting that her husband, Tony Schenk, is a professor of civil and environmental engineering and geodetic science at Ohio State. A full-time move to Western New York is in the future, however. "I like Buffalo and Western New York," Csatho says. "I really love the parks and buildings in the older part. I feel very much at home."